Our young children certainly were part of a big moment last Friday. Simon and Jess had been married for one week by this point, but, as I explained at the beginning, they just had so much fun at their first wedding that they wanted to do it all over again with us. As Simon and Jess circled around each other, the children sang “Am I Awake, Am I Prepared?” I explained that by circling each other Simon and Jess were showing that they would always keep each other safe. Simon then showed everyone their ketubah, or marriage contract. One friend noted that her parents had one, too, but it was at home in a frame. Simon explained that the picture showed two intertwined trees; one friend thought the picture needed a volcano. 1. Thank you, God, for making grape juice and wine. 2. Thank you, God, for creating the world. 3. Thank you, God, for creating people. 4. Thank you, God, for creating people to be good like You. 5. Thank you, God, for special celebrations. 6. Thank you, God, for helping make the bride and groom so happy. 7. Thank you, God, for everything: joy, happiness, laughter; friends, families, and teaches; brides and grooms. May we all be happy together. 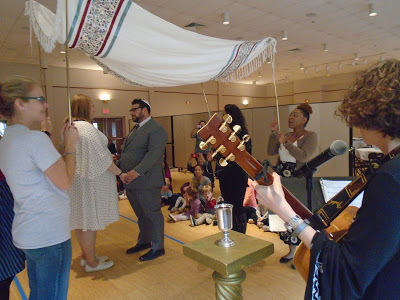 It should be noted that the children were transfixed throughout the entire service. There was hardly any squirming and the room was very, very quiet. We hadn’t talked to the children about being still and quiet, and I would have expected more murmuring and fidgeting. But I think the children sensed that they were part of something sacred and special. After the wedding, it was time to eat. 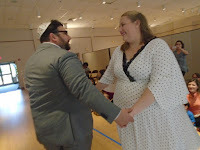 We combined the wedding feast with our Kabbalat Shabbat celebration. Jess lit the candles, Simon led us in kiddush, Simon’s mom blessed her son and new daughter, and we all sang hamotzi together. We enjoyed challah, grape juice, clementines, and cupcakes. Then it was time to share the gifts the children had spent the whole week making. 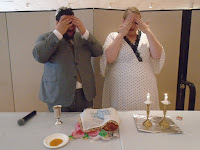 When combined, the gifts made a complete Shabbat Bag for Simon and Jess. 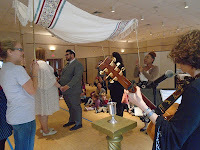 We hoped that they would use the gifts in their new Jewish bayit (home) to celebrate becoming a mishpacha (family) and sharing their ahava (love) for each other. The 2s classes made a tzedakah box for Simon and Jess to put coins in before the start of Shabbat. 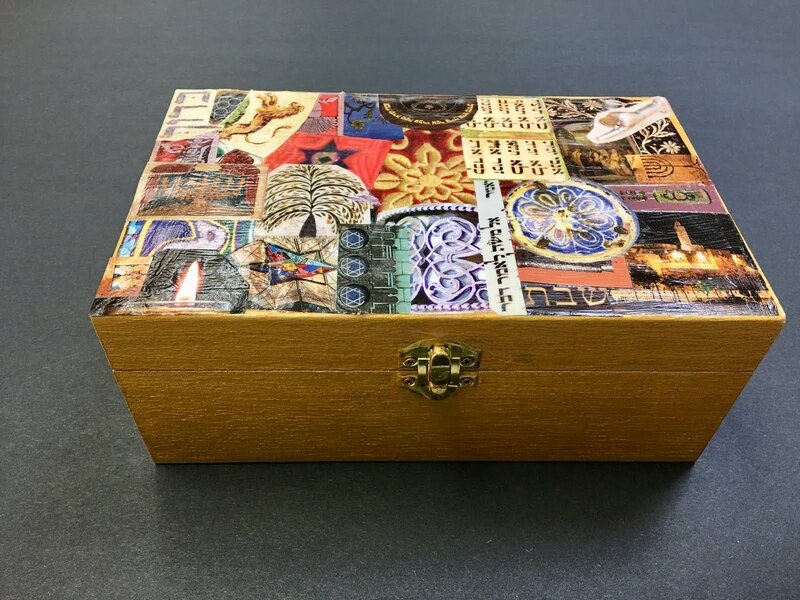 Once the box is full, the money can be given to people who need it more than they do. One class painted it gold, the other glued the pretty pictures on top. The 3s classes made candlesticks. 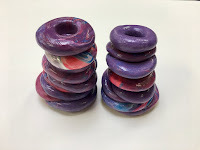 Using Model Magic clay, they mooshed and squished three colors together until they had swirly red, blue, and white or purple. 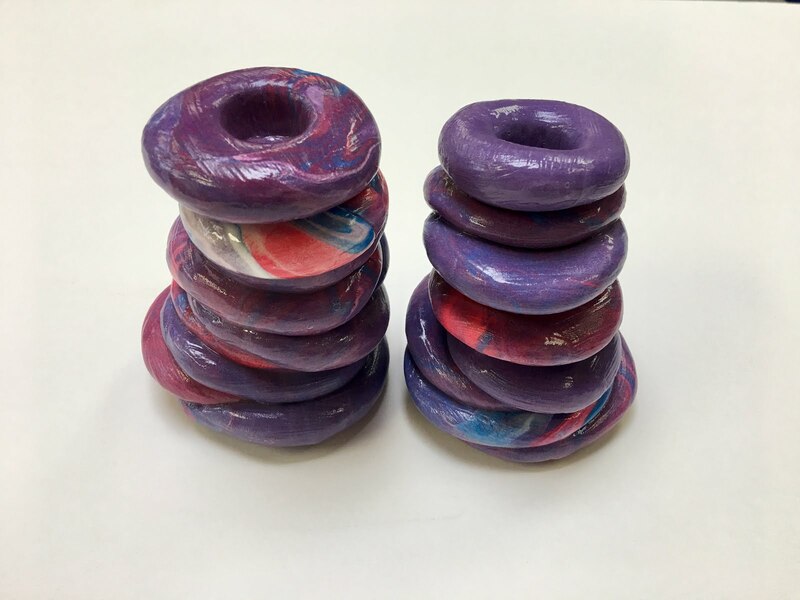 Then they rolled the clay into balls and squashed the balls into pancakes. We then stacked the pancakes, making candlesticks. Each class made one. 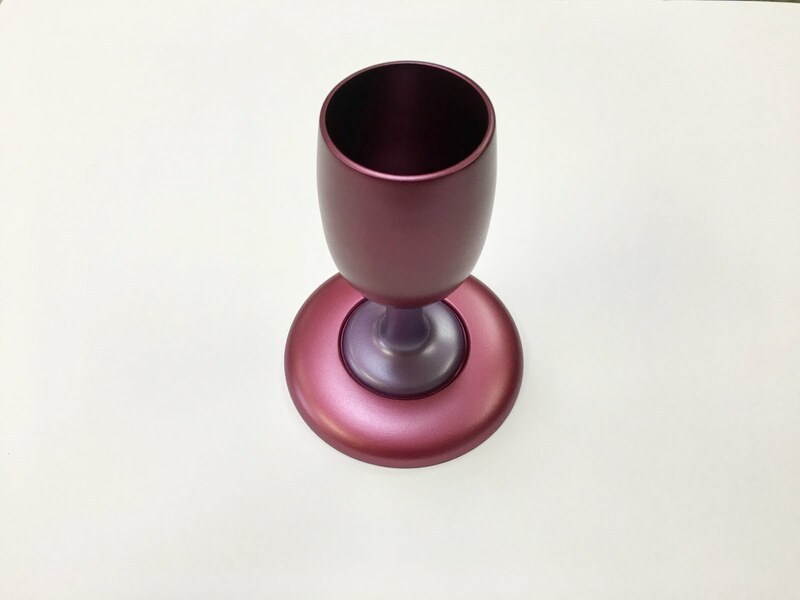 The teachers bought Simon and Jess a kiddush cup, as those are often tricky to make. 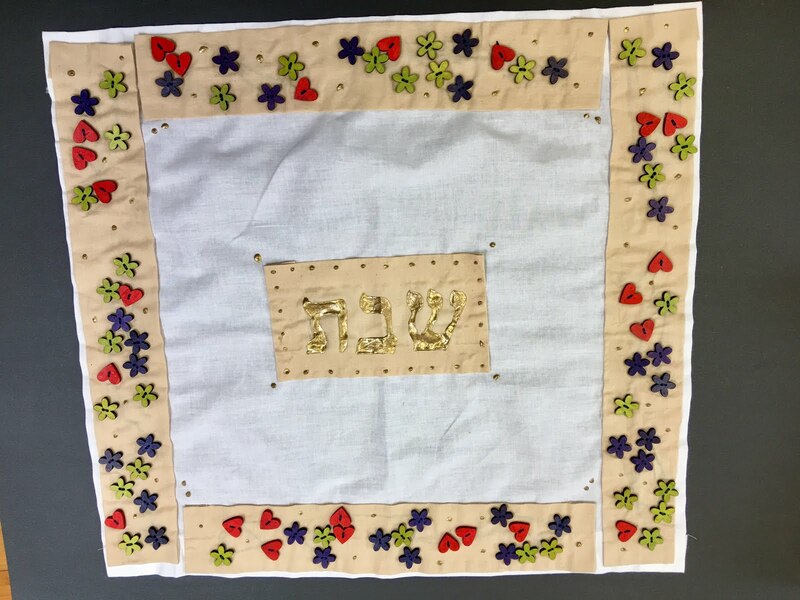 Finally, the 4s classes made a challah cover. 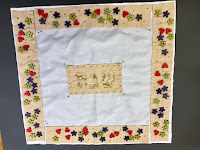 They sewed lots and lots (and lots) of buttons around the border, and Morah Robin wrote Shabbat in Hebrew. For many children and their families, this was the first Jewish wedding they’d ever participated in. For some, it might be the only Jewish wedding they ever see. Thank you, Simon and Jess, for celebrating with us and giving us the opportunity to share in your joy. Wishing you many, many years of happiness. Mazel tov!